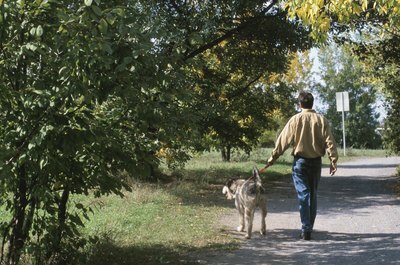 A dog run lets your dog play outside safely when you don't have time to take him for a walk. If you don't have a fenced-in yard, you probably have to supervise your dog while he goes outside. However, if you have things to do inside, you probably will rush him back inside when he's done doing his business. Let your dog stay outside, while you get things done inside, by putting together a dog run in your front or back yard. A dog run is a long cable clamped between two objects with a leash attached. It gives you and your dog a little more freedom. Find two stationary objects to attach a cable between. Choose objects that are far enough apart that the dog has ample room to run (10 feet or more). Make sure the area around the run is clear of obstacles, fences or tree-branches that your dog could tangle or hang himself on. Choose an area that doesn't reach outside of your property line. Screw an eye bolt into each of the objects by hand, ensuring they are high enough off the ground that no one will walk into the cable. Seven feet typically is high enough. Put one end of the cable through one of the eye bolts and tighten it down with a cable clamp. Pull hard on the wire to make sure it's tight. Pull the cable through the other eye bolt. Make sure the cable is pulled tight between the two objects and clamp it in place. Trim any excess cable. Attach a c-clamp to the cable. Fasten the handle end of a leash to the c-clamp. Make sure the leash hangs loosely from your dogs neck to the cable. You don't want the leash to pull on your dog's neck or get caught around his feet while he plays. Set a water bowl down within the distance of the run. Now that your dog is able to exercise freely, he'll need plenty of water. Set up the run in a shaded area of your yard if possible. Check on your dog often if you leave him on the run without supervision. Only put one dog on the run at a time. What Is Ferrous Sulfate in Dog Food? What Kind of Coat Do German Shepherds Have? What Do You Do for the Lingering Smell From a Stray Cat?